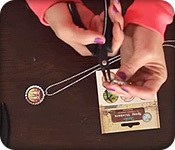 Posted by Kelli on 4/19/2016 to Bottle Cap Inc.
Kelli shows us how to use two handy tools to make bottle cap necklace pendants. 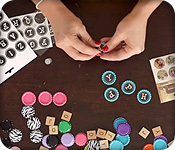 Kelli shows us how to make bottle cap magnets! Simple and fun! 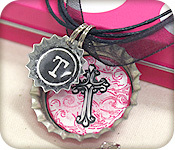 Watch this quick DIY video to learn how to make bottle cap necklaces. 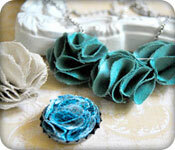 These necklaces are easy and fun to make. Perfect for sports teams, fundraisers or party crafts. Posted by Wende on 1/24/2014 to Bottle Cap Inc.
Video Blog! 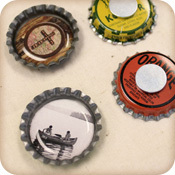 Learn how to make bottle cap magnets. 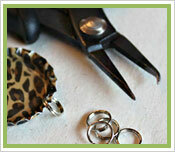 Posted by Wende on 1/21/2014 to Bottle Cap Inc.
How to Make a Bottle Cap Necklace. 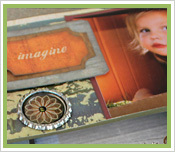 Posted by Kaitlin on 12/14/2012 to Bottle Cap Inc.
Photo inspiration for DIY holiday crafts and photo keepsake ornaments. Posted by Kaitlin on 11/19/2012 to Bottle Cap Inc. 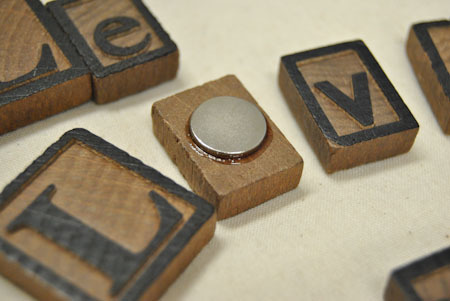 Simply glue a magnet to the back of a bottle cap or wood letter tile and you've created endless possibilities for learning and fun. Posted by Kaitlin on 11/12/2012 to Bottle Cap Inc. 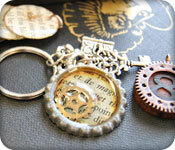 Steam Punk Home Decor and Jewelry Ideas! Posted by Kaitlin on 11/5/2012 to Bottle Cap Inc. 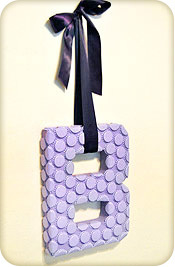 If you love to scrap or paper craft, here's a craft article for you! Posted by Kaitlin on 9/21/2012 to Bottle Cap Inc.
14 ideas to incorporate bottle caps, scrabble tiles and other mixed media onto your beautifully wrapped gifts! Posted by Kaitlin on 9/19/2012 to Bottle Cap Inc. 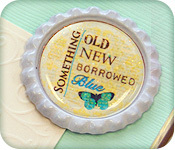 This bottle cap project is perfect for nurseries,children's rooms and even living rooms. Lots of home decor possibilities! Posted by Kaitlin on 8/31/2012 to Bottle Cap Inc. Fabric flowers and bottle caps, a match made in handmade heaven! Posted by Wende on 1/20/2012 to Bottle Cap Inc. Learn how to use our handy split ring tool in this close up video short. Posted by Wende on 1/19/2012 to Bottle Cap Inc.
Joy shows us how she has incorporated bottle caps into her beautiful page designs. Posted by Wende on 1/15/2012 to Bottle Cap Inc. 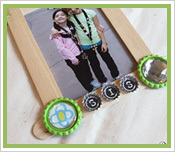 Learn how to make this fun popsicle stick picture frame with bottle cap decorations! 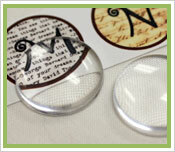 Posted by Wende on 12/5/2011 to Bottle Cap Inc.
What are Cabochons and How Do I Use 'Em?